A Facebook friend (Hi Romaana!!) sent me a link to this mug yesterday and I just about fell off my chair. Don’t make me blog about this. DYING!!!! This is so flipping hilarious because it pretty much sums up my train of thought to a T.
It’s available online at Zazzle. 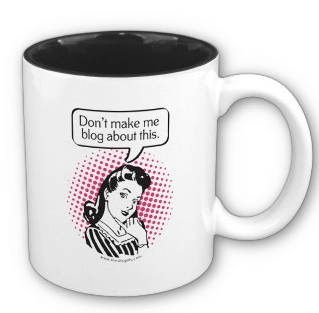 Had to pass it along just in case you are buying a gift for a blogger for the holidays. Believe me – they will LOVE THIS.